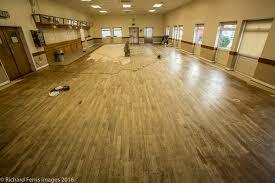 wood floor sanding Ipswich IpswichIpswich and finishing Ipswich Suffolk. Wolsey Theatre Ipswich Museum floor sanding and restoration work. 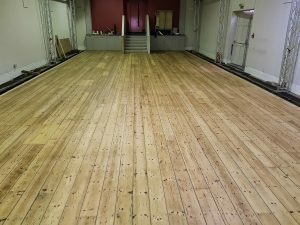 We recently completed the wood floor sanding Ipswich work at the Wolsey Theatre studio in Ipswich Suffolk. The floor was in a bad way with nails sticking up and the flooring was splintering. After punching down the nails and carrying out some remedial work, we sanded the floor back to bare wood and up to a smooth finish. Three coats of a commercial grade junckers polyurethane floor lacquer was applied in a matt finish. The floor was about 180m2 and completed in three days from start to finish, so we was on quite a tight time scale in order so the Wolsey theatre could resume with their rehearsals. The result at the end was great no more splinters with a hard wearing lacquer over the top and a much lighter appearance to the floor.